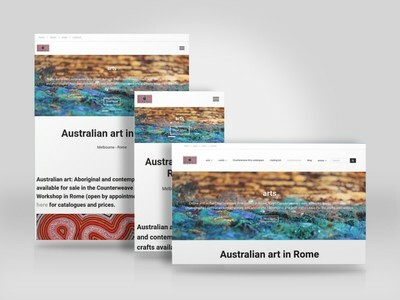 The creatively minded team at Counterweave selected White Rabbit when it came to developing their website, as they expanded and took their incredible collection of Australian art to Rome in Italy. A first in the art world, bringing traditional Australian art and workshops to the galleries and studios of Rome’s exclusive art scene. This bold move required a similarly bold website, to showcase the stunning artwork and visual treats from Counterweave’s collection of artists. Large responsive banners display the fascinating and engaging artwork, while expansive white backgrounds and simple textual content support the artwork and provide in-depth information about all the other crafts and anima available from Counterweave. Layout and design approaches similar to those adopted by major art galleries. With eCommerce integration using Etsy, this website provides an online outlet for this incredible artwork from Aboriginal and contemporary artists, now available in Europe. Items listed in the client’s Etsy store will automatically appear in the websites art catalogues. Additional integrations provide an online appointment booking system, for other therapeutic and creative services offered by the Counterweave team. This responsive website design offers potential customers and art buyers the perfect way to access these incredible artworks, creative workshops and other “anima” available, from any computer or mobile device. Art & Craft workshops can also be booked through the website, with a simple calendar view of all the upcoming workshops available, clients can click through for more information and to book themselves a place on any of the workshops listed. On-going maintenance and updates on the WordPress back-end is carried out by the client themselves as they had previous experience with blogging platforms, so the migration to WordPress was smooth and simple for them. Check out the website to see some of the incredible Australian artwork available to buy and if in Rome, why not book something a little special like one of their craft workshops to pass the time.